Ceramictec - Accessible Handicap Shower…..
emailed me of them and their child. special tile job and shower waterproofing for them and Caleb. and tried my best to make it perfect. this was the accessible shower I just built for them…………. there was mold and a rotted sub floor under old laminate floor. the one piece tub was cut and removed. mold was cleaned up. joists were cut to make new area lower. Kerdi drain was set to proper height. new shower sub floor was installed, glued and nailed. tar paper and metal lath were install prior to mudbed. Schluter Kerdi was done on the shower walls. the shower mud bed was packed along with the Ditra. Kerdi was installed on the shower floor. wall tile was laid out and started to install. 1×1 shower floor tile laid out to the Kerdi drain. shower floor tile set with unmodified thinset. 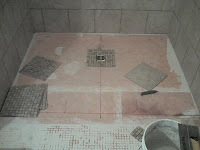 13×13 main floor tile set higher an 1/8″ with shower floor. during the process, and upon completion. Your attention to detail and craftsmanship were evident throughout. You are a true professional. You ensured quality and integrity, and we believe you delivered. It was truly a pleasure to meet you and work with you! I have been a member of the John Bridges Tile Forum for only 3 months now and have been reading the postings (threads) like crazy. For those not familiar with this website – it is an online forum for tile setters to help others both in and out of the business to perfect the art of setting tiles. As a bathroom renovator I have a keen eye for detail and craftsmanship and can say that in those pages Brian’s work is truly flawless and stands out at the top with only a select few. I have searched all his threads and the smallest details he includes are incredible. I am excited to try and incorporate his designs and finishing details into my upcoming projects and only wish he set tile where I live. I believe Brian is a master artisan and a great educator – helping the tile setting industry in a whole raise it’s game. Nice work. Brian. If you ever want to move North Just call me. nice compliment from a builder that's not in Florida. you can tell your work is good when people like it in any market in North America. that’s a wonderful thing you’ve done for them. Interesting and informative. Will you write about this one more? I did write about it more in an updated version of this blog. with more detail, better info. 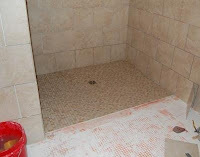 Previous post: Barrier Free, Accessible, Curbless, Roll In Shower…..